We call these ornaments, but we encourage you to think outside the box about how to use them. 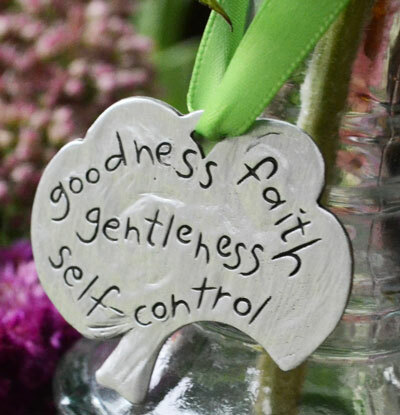 They can be an encouragement, a bookmark, an ornament, a decoration. Hang it somewhere or tuck it away, anyway, anywhere...It is about encouragement! Who does not need to hear the wonderful words, "You are loved"? 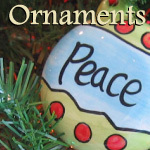 Simple, classy Christian gifts that don't break the bank can be hard to find. Here is the answer. These can be dropped into the mail (no extra postage needed if you send it in a 'normal' sized greeting card). "But the fruit of the Spirit is love, joy, peace, patience, kindness, goodness, faithfulness, gentleness, self-control" Galatians 5:22-23. Crafted in pewter; 1 1/2" x 2".